This is the discussion related to the wiki page	Allegory Of The Two Bothers. Inspired and based on The Cool War. Great thanks to Perelka_L and Randomini! Very strong yes. High quality buns. This seems entirely in-character for the both of them. 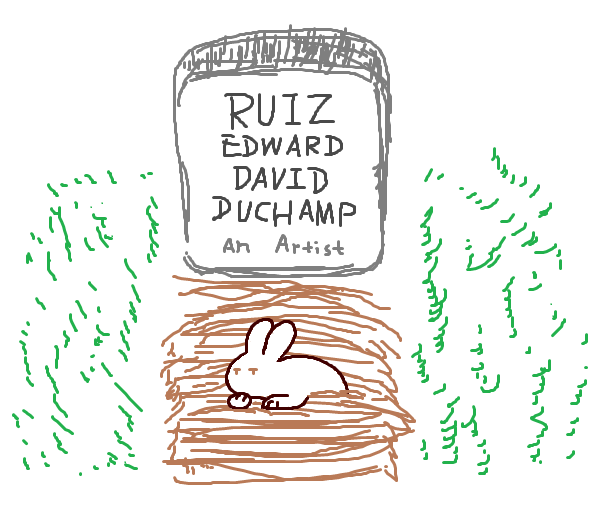 The older bunny is Ruiz Duchamp, and the younger is Pico Wilson, while the Wolf is Mr. Redd? Pico Wilson telling a ded Ruiz Duchamp a story of two buns telling each other stories through childish drawings that is a vague allegory of their childhood. Something like that. Even though I knew where this was going I still got impacted by that end. This is also, I think, some of your best art despite it being really simple. If anything, it's the fact that the art is so simple in combination with how it's used that makes it your best art. Also, it took me the entire cool war and this one, to figure out Ruiz Edward David Duchamp is in fact REDD. It's just an acronym, it doesn't have any bearing on the plot. Hey, I'm from the french branch and I'm currently translating this tale. I wanted to know if the Bothers/Brothers joke is just a joke on the fact that Pico bun wrong spelled the word "Brothers" or this is a joke on the real word "Bothers" ? The first one, just a joke on misspelling. Hi there. Following the translation of Archiviste Judas, emaillons, another member of the French branch composed a musical theme for this tale.